I had some end of season cherries this week so I decided I should splurge on a flourless chocolate cake to share with some real chocolate fiends in my circle. Looks like the time has come to say goodbye to cherries for this year and begin the yearning for the next time they will show up in our markets. Sadly, that’s a whole year away but that seems to be what fruit seasons are all about – anticipation and fulfillment, anticipation and fulfillment. I hope you’ve had a chance to do some canning because you will have to make Gateau Basque sometime to tide you through the long winter. This is a simple recipe that marries chocolate and cherries seamlessly. 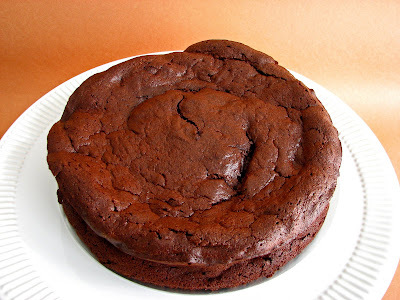 Use the best chocolate and kirsch you can find and you’ll have an ultra moist super-chocolate full-tilt dessert. - This is a very rich cake and will serve a lot of people. - The cake will keep up to 3 days at room temperature. - The recipe also includes a Roasted Almond Crème Anglaise for those who really want to go to the far end of the indulgence spectrum. Place the cherries, water and sugar in a 4 quart saucepan. Cook for 15 to 20 minutes on medium high heat until the juice is syrupy (the mixture will foam). Be careful not to overcook the cherries or they will become too caramelized. You’ll begin to smell them if you take them too far. Drain the cherries, reserving the syrup. Cool. Preheat the over to 325 degrees. Prepare a 9” springform pan with butter and a parchment paper circle. 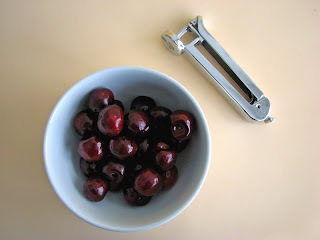 Coarsely chop the cooled cherries. Chop the chocolate and butter into small pieces and melt them together in a heatproof bowl set over simmering water. Whisk slowly to combine. Add 1/2 C of the reserved cherry syrup. Remove from the heat and whisk in the egg yolks, kirsch and cherries. Whip the egg whites until they just begin to hold their shape. Slowly add the 3 T of sugar and beat just until they form a soft peak. Gently fold the egg whites into the chocolate mixture, scraping the bottom of the bowl and making sure you are cutting through the center as you fold. The batter is ready when there are no white streaks. Pour the batter into the prepared pan and bake for 45 minutes. Cool the cake. 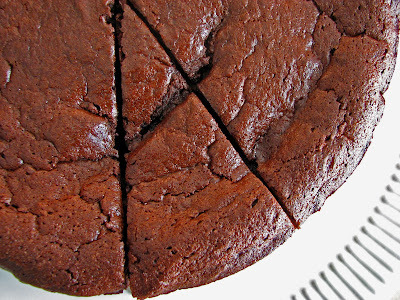 Run a thin knife around the edges to loosen the cake and transfer onto a serving platter. yes, let's cann the cherries for gateau basque! lovely once again. rustic, simple, elegant. you know like no other how to respect ingredients and seasons. Well done. The cake looks wonderful and I love the addition of the cherries. beautiful cake. love the pairing of rich chocolate and cherries. I am sad the summer fruit season is coming to an end! This cake looks divine! Simply stunning! I too long for cherries to be local. I think on our most basic level we are creative beings and as we grow older we tend to get pulled or pushed away from that. Great article! 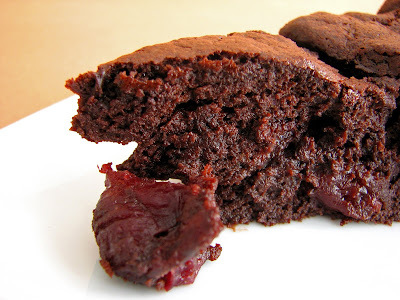 Just picked fresh cherries from my tree and baked your Chocolate Cherry Cake. I can not wait to taste it. thank-you! !